The origins of the Caped Crusader of Gotham City are finally brought to the big screen in this new adaptation of the perennially popular comic-book series. The young Bruce Wayne (Gus Lewis) leads a privileged life as the son of wealthy, philanthropist parents, both of whom stress their commitment to improving the lives of the citizens of crime-ridden Gotham City. 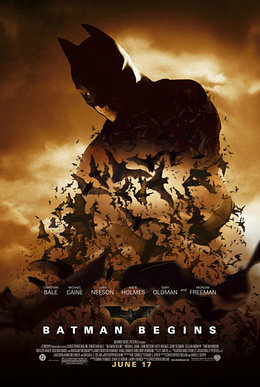 After his mother and father are murdered by a mugger, however, Wayne grows into an impudent young man (Christian Bale), full of rageand bent on retribution until encouraged by his childhood sweetheart, Rachel Dawes (Katie Holmes), to search for answers beyond his own personal vendettas. Wayne eventually finds discipline in the Far East under the tutelage of Henri Ducard (Liam Neeson), a member of the mysterious League of Shadows who guides him in the study of martial arts -- and the ways in which an ordinary man can hone his senses to an almost superhuman acuity. After seven years away from Gotham, Wayne returns, determined to bring peace and safety back to the city. With the help of his faithful manservant, Alfred Pennyworth (Michael Caine), and Lucius Fox (Morgan Freeman), a scientist at his late father's corporation, Wayne develops a secret identity as Batman, a masked fighter for justice. But when a shady psychiatrist (Cillian Murphy) joins forces with the criminal underworld, Wayne realizes that putting an end to their nefarious plans will be very difficult indeed. Batman Begins also features Gary Oldman as Lt. James Gordon and Tom Wilkinson as the crime boss Carmine Falcone.